The BFI Film Index International can be cross-searched along with the AFI Catalog and FIAF International Index to Film Periodicals Database in the encompassing Screen Studies Collection (SSC). Consult the SSC LibGuide for more information. Authoritative: users can access a vast film database that is compiled in association with highly respected institutions. Dynamic: growing collection of work that is updated regularlly. International coverage: full coverage of films from over 180 countries. Cross-searchability: for customers with access also to AFI Catalog or to FIAF or all the 3 products the Proquest platform wil allow to cross search them via the meta database Screen Studies Collection, enabling cross-searching of film information and critical/theoretical film journal information created by a respected archive. Find in-depth, authoritative information on films and key people from the world of film, quickly and easily. Identify key films released during a range of years. Discover films that deal with a specific theme in different periods of history. 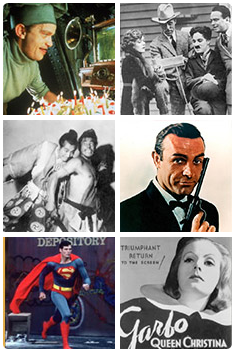 Film Index International by ProQuest is the definitive online resource focusing on entertainment films and personalities. Produced in collaboration with the British Film Institute (BFI) it is based on the Summary of Film and Television (SIFT) database collated by the BFI over the past 70 years. Film Index International includes records on films from over 170 countries and has extensive coverage of international film awards and prizes. Film Index International provides in-depth indexing of over 125,000 films from the first silent movies to the latest blockbusters and biographical information for more than 900,000 personalities. The Film records contain detailed film information including searchable plot summaries, the director, full cast and crew lists, year of release and production information. Credits, awards and a synopsis are also included. The Person records include complete biographical information, a list of Awards received, plus a complete list of the films the subject featured in. Its rich content also includes references to film journals and periodical articles on film and film-makers. The initial selection of records from SIFT for Film Index International is made by directors. The directors selected are those who have made a fiction film shown theatrically that is over 50 minutes in duration, released between 1928 and 1965 and those who have made a fiction film over 60 minutes in duration, post-1965. There are some exceptions; for example, directors with established careers who have made nothing but short films and directors who made feature-length documentaries. These are selected on an individual basis. View our schedule at the link below to locate a session. Can't find what you are looking for or want to request an online or on-site session? Please email us at training@proquest.com.